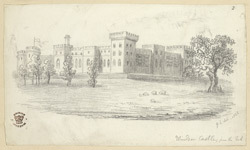 This lively drawing depicts the exterior walls to the castle seen from the surrounding parkland. William the Conqueror founded Windsor Castle over 900 years ago. The castle's elevated position over the River Thames was an obvious strategic advantage, and there were also several hunting-grounds close by. This site was favoured over others due to its proximity to London. It was only one day's march to the Tower of London, where the princes Edward and Richard were imprisoned by their uncle, Richard, Duke of Gloucester, in 1483. Elizabeth Woodeville, mother of the princes, lived at the castle and a picture gallery found here is named in her honour.